So, I’m kind of in the middle of a breakup. About ten days ago, I decided to breakup with sugar. After making (and eating) some of the world’s most delicious grain-free brownies (yes, don’t get weird on me–I’ll still share that recipe with you), I started noticing some things were going on in my body. My joints hurt almost immediately. My anxiety spiked. I felt bad, and generally hungover the next day. But, that didn’t stop my cravings. I wanted another brownie. I wanted a chocolate bar. I wanted a pint of ice cream. This felt like new territory for me. I’ve never been much of a sweets monster. I usually opt for the savory things in life. Steak is my power food. I choose crispy chicken skin over cake. That’s just how I roll. But, recently I began this spiral of chasing my savory meals with a sweet treat. It was a like a switch flipped in my brain upon meal completion, begging for a little bit of sweet sugary crack. After compulsively eating more brownies than one should, I not only felt achy and anxious, but I started to feel out of control. At this point, I ordered The 21 Day Sugar Detox, by Diane Sanfilippo. It was time to call in reinforcements. On the whole, I eat a pretty clean diet. I stick primarily to an ancestral/real food profile. No gluten EVER. Rarely will you find a recipe on here that contains refined sugar. We’re more in that maple syrup/honey/dates/coconut sugar type of camp. There’s lots of grass fed meats, seasonal veggies and fruits. I try to eat this way in order to minimize inflammation in my body. I have Lyme Disease, so keeping my inflammation at a minimum is always a goal of mine. I didn’t like these spikes in joint pain caused by my sugar dalliances, or the other lyme-y symptoms that were popping up. So, I devoured The 21 Day Sugar Detox (21DSD) in one day. Cover to cover. I ate it up like a gosh darn cookie. The book comes with three different plan levels. You determine which one suits you best based on a thoughtfully put together quiz. I am a level three. It’s pretty much a classic Paleo diet with a few modifications. Fruit and strachy veggies are limited in order to cut sugar and carb cravings. Oh, and of course, there’s no sugar whether it be refined or unrefined. And now, here I am, ten days in, and ready to start dishing with you about my journey thus far. 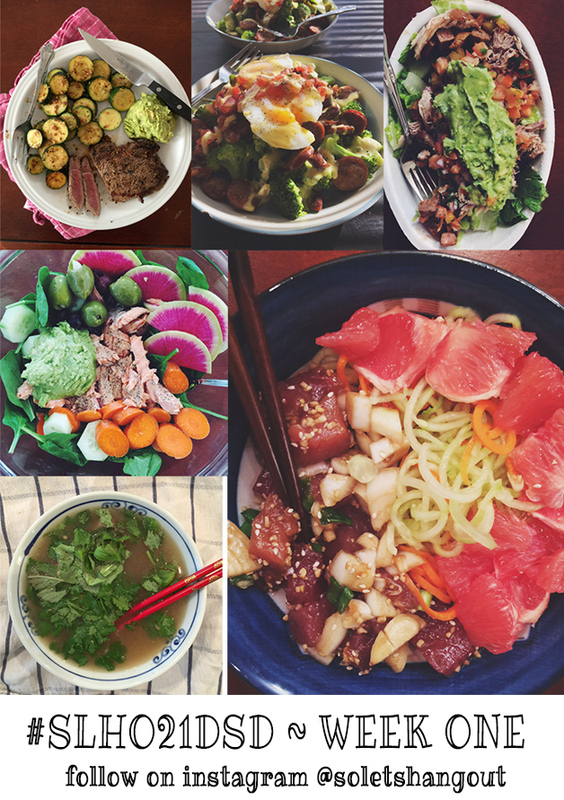 If you want to follow along, I’m posting all of my meals to Instagram so you can get a feel for what this detox looks like. Here are just a couple of snaps from week one below. 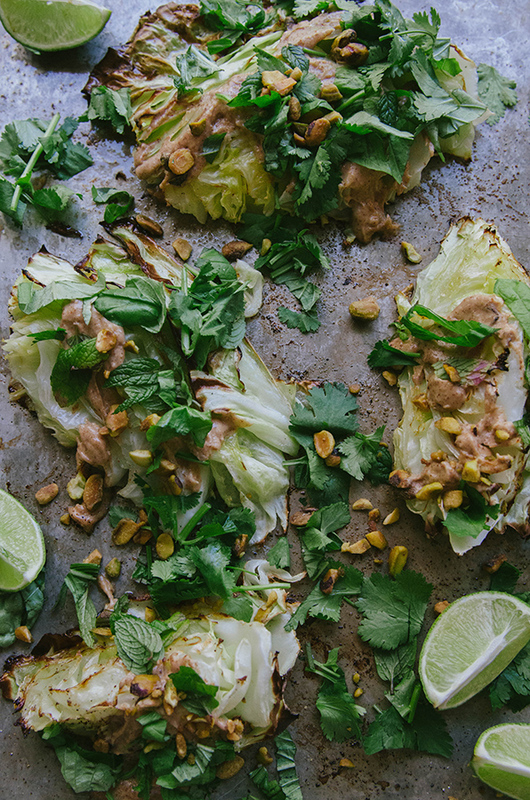 But, before we dive into detoxing details, let’s first talk about roasted cabbage. 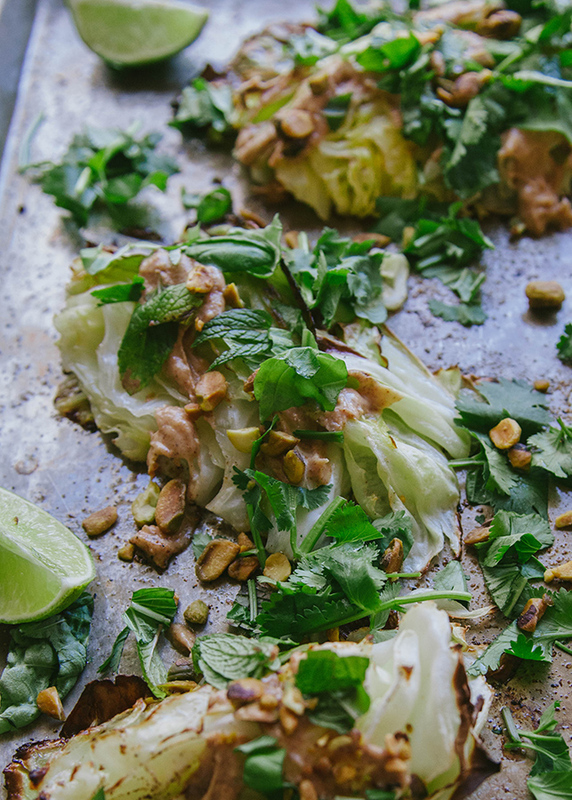 I had some leftover cabbage sitting in my fridge after making my Kalua Pork, so I decided to use it up by roasting it, slathering it with almond sesame sauce and then covering it with herbs and pistachios. UM. HOLY FLAVOR EXPLOSION!!! I could literally eat this every day. I sat in my living room watching reruns of The Bachelor (yes, I’m an imperfect person who watches really terrible television) eating nearly a whole head of cabbage. Once you roast the cabbage it changes. It becomes sweet and juicy and errrrrythang you didn’t know a hunk of cabbage could be. Am I talking this up a bit too much? Maybe. But, I’m honestly real excited about this. Yes. I’m like pee-in-my-pants excited about cabbage. Do I need to get out more? Possibly, yes. Now that I’ve gushed about cabbage for an extended period of time let’s real talk this whole detox situation. Day Zero: This is the day before the detox. In the book, Diane gives your tips on how to prep and calm your anxiety about the experience. A positive attitude is suggested. I, however, decided to eat an entire gluten-free pizza and chase it with half a pint of ice cream. This was not suggested anywhere in the book. This was just me being real-life-ridiculous. After my sad-girl-sugar-binge, I went to Costco and stocked up on veggies and meats for the week. I come home with enough broccoli to feed everyone in my small town. Ok. I’m ready. Day One: I feel good. Well, not that good. I ate all the pizza and ice cream yesterday. I actually feel physically pretty terrible. But, I take it in stride knowing that I did it to myself, and now I’m on the path of ditching my need to sad-girl-sugar-binge. I’m super positive. I’m stoked to have a plan and to make a change. I eat a huge bowl of soup for breakfast in order to pump my system full of homemade bone broth. I make Ahi Poke (without the sriracha), because no Hawaiian girl can be sad while eating a plate of raw fish. My stomach feels angry. I’m gonna guess that’s because I’m still hosting half of a very cheesy pizza in the depth of my insides. That sentence was kind of gross. But, that’s the truth. I’m only kinda sorry. Day Two: I wake up, and I’m already craving sugar. Really? I think to myself, this seems a little ridiculous. I tell myself to get it together. I try to kill the craving by bumping up my fat intake. It was steak for breakfast with a side of guacamole and veggies. In fact, I’m just throwing guacamole on everything. This is just how I live my life now. My new motto? It’s guac o’ clock somewhere. I eat half of my piece of allotted fruit for the day. To stay on plan, I get to choose from the following options: A green apple, a green tipped banana, or a grapefruit. I chose grapefruit. I then text my husband that I would sell my kidney in exchange for a piece of pineapple or maybe a little bit of mango. I’m irrationally grumpy. By the time my husband comes home (he’s also doing this detox with me) I am crying for no reason. Did I mention I started this detox simultaneously with my monthly lady-times? I’m so sorry for those details. I promise this is the last time I every say lady-times on my food blog. Period. The husband springs into action and becomes a front line soldier on the war against sugar. He whips up the weirdest dinner I’ve ever seen. It’s a bowl of broccoli covered in egg salad with celery and a bunch of bacon. I pretend that I’m mad at it. I cry some more. I eat it. It was delicious. I fall asleep on the couch like a weird, sad, bacon-fed baby. Day Three: I wake up feeling pretty good! I have a little extra energy. But, I seem to have lacked the foresight to have defrosted some protein for the morning. We’re going through more protein than I thought we would. I have some ground beef in the fridge so I get that defrosting for lunch. In the mean time, I try to make a smoothie that stays on plan. I use part of a green banana. This feels dangerous. I feel like I’m using up my fruit allotment real early in the day. I throw a carrot into my smoothie too. You learn quickly which veggies are sweet. I add coconut milk, orange zest, vanilla and a bunch of other stuff to excite my taste buds. It works. I have a late appointment that evening, and by the time I get out of there I’m exhausted. I stop at Chipotle and get a salad with meat, salsa, and guac. Like I said, It’s guac o’ clock somewhere. By the evening time I am wrecked. I fall asleep on the couch like a weird, sad, guacamole-fed baby. My husband can barely wake me up to go to bed. I sleep walk upstairs and don’t wake up until nearly 10am the next day. I guess I needed some sleep. Day Four: My digestion seems pissed off. I wont go into crazy detail… but, yikes. My body seems to want to eliminate all the things. I feel awkward talking about poop, but lord knows I’ve already made things weird by saying “lady-times”, so we’re pretty much still on track. I made soup for breakfast hoping that consuming my weight in bone broth will give my gut the helping hand that it needs. I treat myself to a castor oil pack and an epsom salt bath concurrently. I emerge from the bath super tired and achy, like I have the flu. As someone who spends a great deal of their time detoxing from Lyme, I understand that this isn’t necessarily a bad thing. Detoxing can sometimes feel bad before it feels better. I drink a ton of lemon water, eat lots of veggies and allow my body to rest. On the plus side, I realize that my blood sugar has been pretty darn stable. I haven’t had one of those crazy-shaky-hangry-gimme-all-the-food-before-I-die blood sugar dips in a while. I usually have one of those a day, so this is good news! Day Five: I wake up feeling pretty rested. I have a spike in energy and decide to make myself a fancy breakfast complete with hollandaise sauce. I feel like a breakfast badass. My digestion still feels grumpy. I make more soup for lunch to help calm my tummy. By the afternoon I have to slow down because I’m starting to feel a great deal of brain fog. I feel like I’m trudging through mental sludge. I also feel really bloated and uncomfortable. My gut looks bigger than when I started. Oh, detox. You’re fun. On the plus side, I feel like I’m definitely getting the hang of eating this way. Macadamia nuts are quickly becoming one of my close and personal snack-y friends. Day Six: It’s the weekend! My husband and I decide to make an epic breakfast together. There’s chorizo and eggs and a pile of broccoli… oh, and of course hollandaise because it seems to be my new obsession. We high five over this breakfast. Like, literally put our forks down and high five each other. It was that good. We both get flu like symptoms in the afternoon. Body aches, fatigue and an overall feeling of being unwell. We check the book. It pretty much confirms that we’re right on track. We don’t worry too much about it and just rest. Resting has been key during this detox experience. We talk about how much harder this is than we thought it would be. We make pork chops for dinner, and they’re everything. Day Seven: My husband has to go into the office even though it’s a Sunday. I decide to spend the time playing in the kitchen. This is when I made the roasted cabbage and changed my own life. I also welcome the arrival of THE BIGGEST ZIT TO EVER GRACE MY FACE. Welcome, Sir. You’re impressive. Other than this lovely mark of detox, I notice that the rest of my skin looks smooth and soft. Huzzah. My digestion is starting to figure itself out and I feel ever so slightly less bloated. My mood is slightly more even. Good things! Preheat the oven to 425 degrees. Cover a baking sheet with aluminum foil or parchment paper and set aside. Chop your cabbage into wedges. Remove as much of the core as your can. Place the wedges onto the foil lined baking sheet and drizzle with coconut oil. Spice up the wedges with salt, pepper and granulated garlic to your taste. I used each pretty liberally. Roast the cabbage for twelve minutes. Remove the pan from the oven, flip each piece of cabbage and put back in the oven to roast for an additional eight minutes. 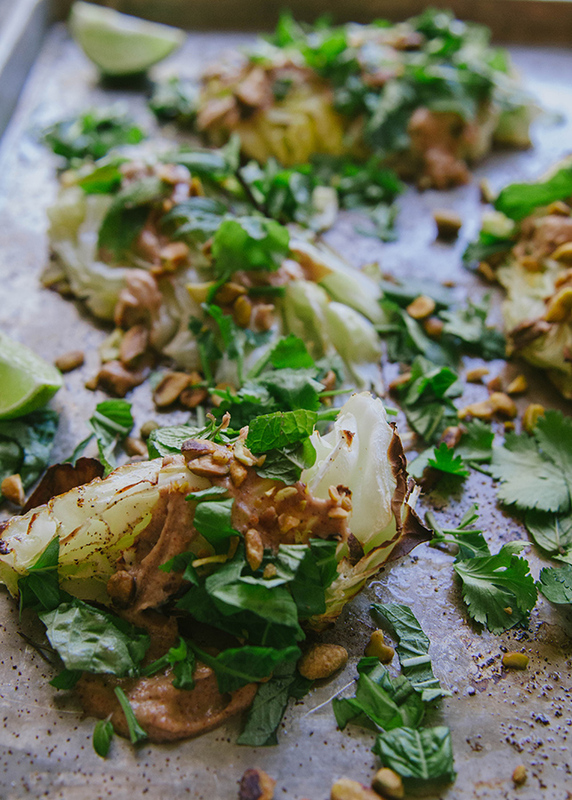 While your cabbage is roasting, make your almond sauce. In a small sauce pot, add your almond butter, water, lemon juice, coconut aminos and sesame oil. Stir it constantly as it heats up. Once it gets hot all of the ingredients will come together and it will turn into a creamy sauce. If the sauce is too thick, simply add more water a Tbs at a time until it reaches your desired consistency. Remove the finished cabbage from the oven and drizzle with almond sauce. Top with fresh herbs and pistachio nut meats. Serve with lime wedges and enjoy! Girl, you are so much stronger than me. I did the no sugar thing for a couple of months (ok, not nearly so drastic – I only axed added sugars, so fruits were still in…) and it was hard as heck. Also, you KNOW there’s no such thing as an overshare, so bring on all the talk. I’m not mad. Except maybe about nut meats. I’m a little mad about nut meats. Keep on keepin’ on! The skin thing totally happens to me too… I’ve done 2 Whole 30s and a few partial wannabe sugar detoxes and my skin will get really smooth and even but I will get a huge cystic pimple, and as soon as that one disappears, another one pops up somewhere else. Today I randomly got a big, red, painful one between my neck and shoulder! So random and annoying. Any good tips for getting rid of them? Oh Gina, you make laugh out loud! You’ve described everything so well, it makes me feel that I might be successful doing something like this. And way better off for having done it. Thanks so much for sharing your journey through sugar detox, you weird, sad, bacon-fed baby. Wow! Good for you! I hope you are feeling a little bit better, baby steps, right?! I just discovered the beauty that is roasted cabbage and I can’t get enough, so I’m trying this one immediately. Keep up the good work, girlfriend! So this comment is super late, but I was just reading this post on your first week on the 21dsd. I love your writing style. I completely sympathize with you! Your writing made me laugh, cringe, and relate to the max! I’m glad you are writing for theKitchn now because I don’t know if I would have ever found you before! Basically I wish that your blog title was a call to hang irl, because I totally would. You are so right. This is one of the best cabbage dishes ever! Made it tonight & will add it to my list of favorites. Wow. So glad I found this recipe. On 2nd day of Whole30. You saved dinner!! !